At over 3500 square feet Diveline is without doubt the largest dive shop in East Anglia, it is manned by knowledgeable and experienced divers who can offer help and advice on our extensive range of diving equipment, courses and servicing. Diveline are the largest dive training academy in East Anglia; they have their own on site heated pool and 2 full multimedia classrooms to enable you to learn at your convenience during Days, Evenings or Weekends! 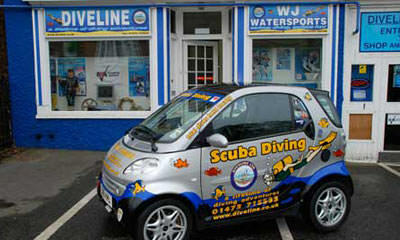 Diveline cater for divers and snorkel divers alike with the largest range of masks, fins, snorkels and buoyancy vests in the area from all manufacturers.Diveline have 3 new fully equipped individual workshops for regulator & equipment servicing, cylinder testing & cleaning and finally the newest addition a drysuit repair workshop to cater for all your servicing needs. Diveline have fully trained onsite technicians for Poseidon, Aqualung, Beaver, TUSA, Dacor, Apeks, Sherwood, Suunto, Seemann Sub, Buddy, Citizen, Cressi, Waterproof, Northern Diver, OThree, Custom Divers, Ralf Tech, Deep Outdoors, Beuchat, Zeagle and many more. All of Divelines technicians are manufacturer trained to the highest possible standard, and are able to look after all your equipment servicing needs; we also have extensive onsite IDEST approved cylinder testing facilities.